This article is about the actress. For polyglot linguist and language teacher, see Michel Thomas. Michelle Doris Thomas (September 23, 1968 – December 22, or 23, 1998) was an American actress and comedian. She was best known for her roles as Justine Phillips on the NBC sitcom The Cosby Show (1988–90), and Myra Monkhouse, Steve Urkel's girlfriend on the ABC/CBS sitcom Family Matters (1993–98). Thomas was born in Brookline, Massachusetts on September 23, 1968 to Dennis Thomas, a member of music group Kool & the Gang, and Phynjuar Thomas, a stage actress. Thomas grew up in Montclair, New Jersey and was an alumna of West Essex High School; graduating in 1987. She was crowned Miss Talented Teen New Jersey in Hal Jackson's Talented Teen pageant, and in July 1984, at the age of 15, became International Queen in the International competition in Montego Bay, Jamaica . 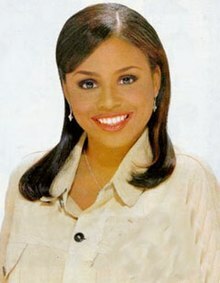 From 1988 to 1990, Thomas portrayed Justine Phillips, the girlfriend of Theo Huxtable on The Cosby Show. She later appeared on various television programs during the late 1980s and 1990s including A Man Called Hawk and Thea. Thomas had a role in Dream Date in 1989. In 1991, she had a small role in Hangin' with the Homeboys. Thomas also appeared in music videos for Boyz II Men, Mint Condition, Dru Hill, and Chubb Rock. In 1993, Thomas won the role of Myra Monkhouse in Family Matters. In 1997, Thomas served as a guest host of the weekly music series Soul Train. After Family Matters ended in 1998, Thomas portrayed Callie Rogers Stark, an aspiring singer on The Young and the Restless. In October 1998, Thomas took a medical leave. In August 1997, Thomas was diagnosed with a rare form of stomach cancer, intra-abdominal desmoplastic small-round-cell tumor. She underwent surgery to remove a lemon-sized tumor shortly before landing her The Young and the Restless role in the spring of 1998. In October 1998, she underwent surgery after a second cancerous growth ruptured. After being released from the hospital, Thomas flew home to New Jersey to spend Thanksgiving with her family. On December 22, or 23, 1998, aged 30, she died surrounded by her family and friends in New York City at Manhattan's Memorial Sloan-Kettering Cancer Center, On December 26, 1998, a Muslim funeral service was held, as per her request. She was buried in Montclair, New Jersey. 1989 A Man Called Hawk Ruthie Carver Episode: "Choice of Chance"
1997 Malcolm & Eddie Brooke Bellamy Episode: "Roofless People"
^ a b c d e f g h Pace, Eric (December 28, 1998). "Michelle Thomas, 30, Actress On TV Soap Opera and Sitcoms". New York Times. p. 8. Retrieved 2012-03-30. Michelle Thomas, an actress in the television programs The Cosby Show, Family Matters, and The Young and the Restless, died on Wednesday at Memorial Sloan-Kettering Cancer Center in Manhattan. She was 30 and lived in Los Angeles, though she had been staying with her family in Weehawken, N.J., since November. ... She was born in Boston, Mass., grew up in Montclair, N.J., and graduated from West Essex High School in North Caldwell, N.J.
^ Chambers, Cheehsa. December 29, 1998, Variety, Michelle Thomas obituary; accessed June 3, 2016. ^ a b Entertainment Weekly, January 8, 1999, Monitor; accessed June 3, 2016. ^ The Milwaukee Journal Sentinel, December 26, 1998, Michelle Thomas, Television actress, Dies[dead link]". ^ Campaniolo, Jennifer (2014-09-15). Legendary Locals of Brookline. Arcadia Publishing. p. 23. ISBN 9781439647226. ^ "Classmates - Find your school, yearbooks and alumni online". Classmates.com. Retrieved January 31, 2018. ^ "Our Proud History-Hal Jackson's Talented Teens!". Talentedteens.com. Retrieved 2017-12-14. ^ Ross, Pinnie (September 8, 1984). "2000 at Miss Talented Teen Pageant". Baltimore Afro-American. Retrieved July 14, 2013. ^ "A pint-sized Michelle looms large". Kingston Gleaner. August 4, 1984. p. 6. ^ a b Michelle Thomas, 'Family Matters' TV Star, Dies of Cancer At 30. Jet magazine. January 18, 1999. Retrieved June 7, 2010. ^ a b "Y&R's Thomas Dies Of Cancer At 29". CBS News. December 29, 1998. Retrieved June 3, 2016. Actress Michelle Thomas, who had television roles in The Young & The Restless, The Cosby Show and Family Matters, has died of cancer at age 29. [sic] Thomas died December 22 in Manhattan, according to her publicist, Kahdijah Bell. ^ "Boston-born actress Michelle Thomas, dead at 29". Bay State Banner. February 11, 1999. Archived from the original on November 4, 2012. Retrieved June 3, 2016. ... has died as a result of a desmoplastic small round tumor, a rare form of cancer, at age 29. ^ "Soap actress dies". Toronto Star. December 30, 1998. Retrieved June 3, 2016. This page was last edited on 13 March 2019, at 18:25 (UTC).